None. Working on new book. Tues. Feb. 13 @ 6:30: M. Judson Booksellers & Storytellers’ Page Pairings, Greenville, SC. With Alan Michael Parker. “The Aftermath of Crime,” with Mike Lawson and Todd Scott, 10-11 a.m.
“Multilayered Plots and Complex Characters,” with Jason Makansi and Brendan Mathews, 11:30 a.m.-12:30 p.m.
“Twisted Plots,” with Fiona Davis, Cynthia Swanson, and Mindy Tarquini, 4-5 p.m.
Thurs. March 22: Virginia Festival of the Book, Charlottesville, VA. Panel: “Secrets and Betrayals: Fiction,” 4-5:30 p.m. With Marisa de los Santos and Sonja Yoerg. Tues. April 10 @ 9:30am: Sensoria: A Celebration of Literature and the Arts, Central Piedmont Community College Levine Campus, Levine Auditorium 2150, Charlotte, NC. Wed. April 11 @ 12:30: Alabama Author Awards Luncheon, Alabama Library Association Annual Convention, Florence, AL. Thurs. April 12 @ 7 p.m.: Gertrude & Harold S. Vanderbilt Visiting Writers Series at Vanderbilt University, Nashville, TN. Reading with Matthew Baker. Sat. April 21 @ 3 p.m: Alabama Book Festival, Montgomery, AL. Panel: “Southern Suspense.” With Gin Phillips. Haigler House Tent. Sat. April 28, 1-3 p.m. Main Street Books’ Independent Bookstore Day celebration, Davidson, NC. Fri. May 4, 6-9 p.m., Celebrating Charlotte Lit’s 2nd Birthday Among the Trees at Wing Haven, Charlotte, NC. 4 p.m. Sept. 8: In Conversation with Patrice Gopo, author of All the Colors We Will See, Main Street Books, Davidson, NC. Nov. 2-4, North Carolina Writers Network Fall Conference workshop and reading. Charlotte, NC. April 1 10 a.m.-noon, Short Story Workshop, Charlotte Writers Club, Charlotte, NC. May 4 @ 7 p.m. Main Street Books Sycamore Release Party, Reading and Signing, Davidson, NC. May 6 5-9 p.m. Center City Literary Festival, Reading and Signing, Charlotte, NC. July 14-16: Writing in Place Conference at Wofford College in Spartanburg, SC, hosted by Hub City. October 6 @ 7pm: Charlotte Center for Literary Arts (Charlotte Lit). Readings at the Light Factory next to Charlotte Lit. With Patrice Gopo, Rebecca Gummere, Travis Mulhauser, Trace Ramsey, and Eric Smith as part of the NC Arts Council Artist Fellowship readings. Sunday, October 8 at 2pm: Quail Ridge Books, Raleigh. With Mark Cox, Angela Davis-Gardner, Patrice Gopo, Elisabeth Corley, Travis Mulhauser, and Trace Ramsey as part of the NC Arts Council Artist Fellowship readings. October 20 @ 7pm: Scuppernong Books, Greensboro, NC. With Patrice Gopo, Allison Hutchcraft, Elisabeth Lewis-Corley, Trace Ramsey, and Julie Steinbacher as part of the NC Arts Council Artist Fellowship readings. October 22 @ 2pm: McIntyre’s Books, Pittsboro. With Elisabeth Lewis-Corley, Travis Mulhauser, Trace Ramsey, and Julie Steinbacher as part of the NC Arts Council Artist Fellowship readings. October 27 @ 11 a.m.: A Moveable Feast, Litchfield Books, Pawleys Island, SC. January 14 @ 7 p.m.: “The Writing Show: The Art of the Short Story” panel, Hub City Writers Project, Spartanburg Public Library, Spartanburg, SC. “New and Noteworthy”(10-11:00 am Sun, Mar 13, Integrated Learning Center Room 141). With Carmiel Banasky and Vanessa Blakeslee, moderated by Liza Raiser. “Short Stories” (1-2 pm Sun, Mar 13, Koffler Room 204).With Luis Alberto Urrea and Andrew Milward, moderated by Laura Penny. I’ll also be signing books at the University of Nebraska booth (Booth 120) 3:30-4 p.m. Sun March 13. For the more details, go to the TFOB schedule and click on my name. (Here is a pdf of it, too). The full festival schedule is here. March 14-15: Faculty, Tucson Festival of Books Master Workshops. March 31-April 3: AWP Conference in Los Angeles. Signing books at Prairie Schooner booth (#700) 10:30-11:30 Saturday April 2. April 21: Reading at Vanderbilt University Gertrude & Harold Vanderbilt Visiting Writers Series, Nashville, TN. June 26-July 9: On Fiction Faculty at the Sewanee Young Writers Conference at the University of the South in Sewanee, TN. Saturday, Oct. 15, 11:30am – 1:00pm, Room 29, Legislative Plaza: I’ll be on the panel “The Rural, the Urban, and the Search for Home: Navigating Landscapes in Short Stories” with Kathy Flann and Laura Hendrix Ezell. May 15-June 13: Jentel Artist Residency, Banner, Wyoming. June 28-July 11: On Fiction Faculty at the Sewanee Young Writers Conference at the University of the South in Sewanee, TN. 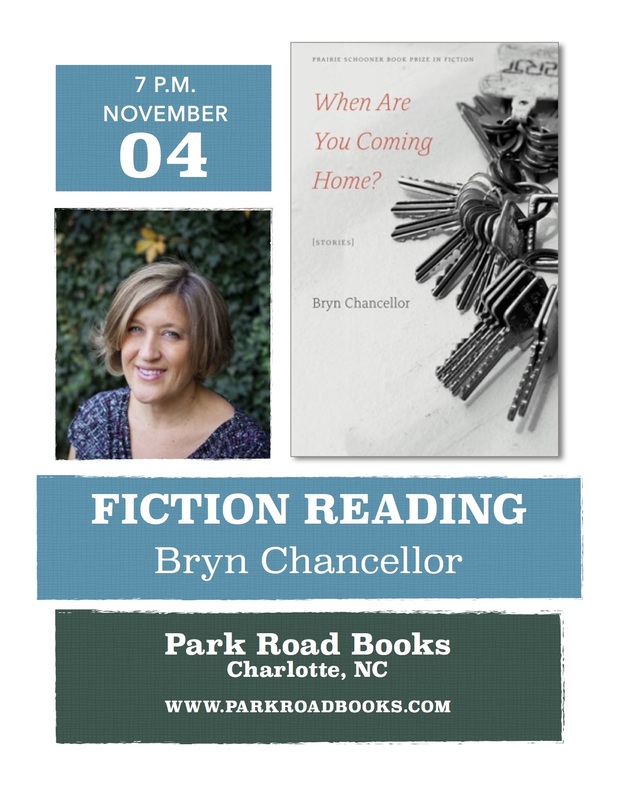 November 4 @ 7 p.m.: Reading at Park Road Books, Charlotte, NC. November 19 @ 7 p.m.: Reading at Winthrop University, Rock Hill, SC. June 29-July 12: On Fiction Faculty at the Sewanee Young Writers Conference at the University of the South in Sewanee, TN. Oct. 19: Poets & Writers Maureen Egen Writers Exchange Award reading, McNally Jackson Books, New York City.